Millennia of unchecked accumulation on the part of some, and the consequential dispossession of others, has culminated in the extreme polarisation of wealth we see in the world today. The real resources of life - the land, the minerals and the energy reserves of Planet Earth - are now owned by a faceless few who have built a protective wall around them - a bastion separating the dispossessed from their birthright. It's called the Free Market. Through the Free Market, we may buy but not possess, use but not control, eat but not grow, visit but not stay, live but not prosper. To common man of the modern world, the Free Market is the only means he has of transforming his labour into the needs of life. To survive, he must exchange what he has for what he needs. But he can only do this via the Free Market. The faceless few, and the establishment which serves them, will argue that the Free Market provides everybody equally with what the possession of land, minerals and energy resources once did: namely the 'means of transforming' one's work into wealth. But the Free Market, they say, does the job much better by allowing people to specialise completely while benefiting fully from the skills of others. Furthermore, they say, unlike the natural resources of Planet Earth, the Free Market cannot be carved up and bought: one cannot purchase a market share. One can only win a market share and hold onto it by providing the best products and services in fair competition. Since people always will have a wide range of needs, a fair return for one's labour is always guaranteed. Thus, as in a communist state where all the real wealth-generating resources are commonly owned, so too in a market-based society the one single wealth-generator - the market - is in effect commonly owned by all. All are deemed equal before the market. If such a system were fair, then I submit that any artisan, of any trade, provided his work were of an acceptable standard, should by right have an equal share of his market sector with all the other artisans of his trade. I submit further that such a market system should include mechanisms to ensure that this is what happened so that everybody's needs of life were assured. But this is not what happens. This is not what has happened. What has happened is that centuries of unchecked accumulation by some, and the consequential dispos­session of others, has culminated in the extreme polarisation of market share we see in the economy today. The real market - where the fruits of human effort are exchanged for the needs of life - is now also effectively owned by that faceless few. Their possession and control of wealth is protected by a double wall or bastion that they have built around it. This wall or bas­tion is an insidious mechanism that auto­matically concentrates wealth. It ensures that the rich always get richer and the poor always get poorer. The first layer of this double wall is the Free Market. This prevents common man from freely using the natural resources of his native planet to turn his labour into his needs of life. The second layer of this double wall is the joint-stock limited-liability company (or pessoa juridica). This prevents common man from freely trading his labour for his needs of life within the Free Market. Capitalism has thus erected two impenetrable barriers between mankind and what is self-evidently his inalienable natural birthright. The capitalist saw long ago a need for a wall to protect himself against the raging tempests of that cruel sea we know as the global free market. Though he usually gains a fortune by employing his capital to make a profit from the work of others, he could lose everything if a venture were to go wrong. And sooner or later, one does. So to protect his personal wealth against bad fortune, he fabricates a legal entity called the joint-stock limited liability company. The labourer, on the other hand, cannot protect himself by this means. The legal complexities, capitalisation requirements and operating costs of the limited liability company have made it difficult if not impossible for the ordinary person to own. It has therefore always been - and must forever remain - an instrument of the rich. The economy of Planet Earth thus comprises an elite few who own (or otherwise control) the economically productive resources of the planet. They continually exchange what they have for what they want through joint-stock limited liability companies, which serve as protective access ports into a world wide communi­cations infrastructure and free-trading protocol known as the free market. The dis­possessed majority of the Earth's population provides this economy with its two vital needs. 1) a source of cheap and willing labour when required. 2) a desperate and insatiable sink for its produce - again, when required. Clearly therefore, the Global Free Market is 'free' only to the capitalist: that is, one who owns, or otherwise commands, enough of the planet's productive resources to allow him directly to transform his own labour into his needs of life. In other words, one who does not need to sell his labour to somebody else in order to survive. Free trade (that is, trade that comprises a fair exchange with the equal and unpressured volition of both the parties) can only take place between capitalists. A labourer: one who owns, or otherwise commands, none of the Earth's productive resources, must sell his labour to one who does. Otherwise he will die. In other words, one (the labourer) to whom the sale is a matter of life and death is forced to trade with another (the capitalist) to whom the sale is simply a matter of ex­pedience. Trade between capitalists can be free and fair, but the capitalist's total control of the Earth's resources ensures that labour is always a buyer's market. Sometimes, for example when there occurs a sudden leap in technology, labourers possessing a certain new specialist skill may be able to command enormous salaries and hence temporarily create a seller's market for their labour. But such times are always short, and they affect only a very narrow sector of the whole labour market. Others quickly adopt their new high-demand skill thereby swelling their numbers and relegating them to a buyer's market once again. The active elements of the Global Free Market are the limited liability joint-stock companies through which the capitalist possessors of the planet conduct their trade. These operate independently. They answer to nobody. Their activities are subject to no central means of control. They are supposedly 'self-regulating' within 'the law'. The Global Free Market, which they constitute, is a free-running complex dynamical system. 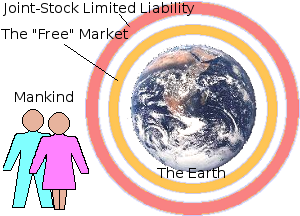 Its overall behaviour, and the consequences this precipitates upon the individual inhabitants of the Earth, is therefore complex, and is determined solely by the rules by which its component elements (the limited liability joint-stock com­panies) interact with each other and with the individuals who, in order to live, are forced to trade with them. If the rules by which joint-stock limited liability companies traded with each other (and with individuals) were equally fair to all, irrespective of their massive variations in size, and were everywhere the same, then trading could possibly be fair. But they are not. A predatory company, by taking over smaller companies (or, by putting them out of business through competition), is thus free and able to take over the market shares of those smaller companies and add them to its own. This process is free to con­tinue unhindered like a creeping cancer until the entire global market is under the control of a single enterprise. Prime examples of capitalist agglomeration of market share are the big super­markets. In the U.K. one or two massive super-market companies are now well on their way to controlling the entire consumer market. Almost all trade between domestic consumer and producer now has to be routed through them, thus em­powering them to siphon off a painful percentage of the profit on every transaction or movement of goods between small producer and domestic consumer. Further­more, while a supermarket's customers are essentially confined to its home nation at present, they are unlikely to remain so. The big supermarket chains in all cap­italist countries are, by nature, expansionists. Their eternal quest is to seek out smaller peers all over the world to buy out and take over, thus expanding their national cartels into larger global ones. Since the introduction of the limited liability company in the middle of the nine­teenth century, the history of commerce has been characterised by one industry shake-out after another. Every industry has started off with a few small entre­preneurs and inventors. Then, when what they are doing is seen to be useful, many more like minds join them and produce variants to suit every taste. An industry of artisan traders is born. But this is always short-lived. Inevitably, when an industry has stood the test of time, and is seen as a potentially lucrative source of profit, in steps the capitalist. An insidious one-way process of take-overs and buy-outs then ignites. Soon the industry is under the sway of a small cartel of big names. Product standardisation sets in. Variety and diversity disappear. Innovation ceases. The direction of product devel­opment is switched to fulfil marketing expediencies rather than sound engineering objectives. It has happened to the motor industry. It is at the moment happening to the industry to which I once belonged; namely, the computer software industry. Even here, a once rational industry is being gobbled up by giants who employ the super-market method of glossy presentation to stimulate the business consumer into buying im­pulsively from a graven image that has been carefully sculpted by marketing spin-doctors. The consumer is thus forced to follow an ever-changing string of product fashions, which appeal to the malleable minds of young impressionables desperate to be seen to belong to the right clique. Rational thinking buyers must be content with whatever this newly-consumerised market condescends to offer them. The laws of nature ensure that its systems are kept within pre-ordained limits of size, energy and mass. Atomic nuclei the size of golf balls are simply not allowed. As a natural complex dynamical system, society, if not interfered with, is also regulated by the natural laws of conscience, which ensure that its component subsystems - family and community - adhere to pre-ordained limits of size, behaviour and wealth. Economic entities the size of multinational companies are simply not allowed. But unlike the forces of nature, human beings possess a degree of self determin­ation. They can bend the rules by which they ought to behave. By enacting the un­natural rules of limited liability, they removed the natural upper limit on the relative wealth and power of individuals, thus paving the way for the economic enslavement of the many by the few. A free complex-dynamical economy, in which an infinity of independent proprietors create and exchange goods according to fair universal rules, is, and always has been, a myth. And with the advent of the joint-stock limited liability company, the prospect of its ever becoming a reality has been pushed ever further into a world that one can only dream about. What should have been a fluid society of free individuals, families and communities - creating and exchanging to the mutual benefit of each - has been curdled, by global capitalism, into a viscous jelly in which true individual free enterprise is im­prisoned, frustrated and suppressed. The great joint-stock limited liability companies of the world constitute a global free market. By trading globally they stand to gain profit from the whole of the planet's economic resources: not only the ones within their own local geographic hinter­lands. To these commercial leviathans, therefore, the nation-state is a nuisance. It is an undesirable relic of the past. It imposes unnecessary barriers to free trade. It levies taxes that milk their profits. It imposes customs and excises on the free ex­changes of their goods. However, the capitalist can never hope to eradicate the nation-state. Its being, form and structure are upheld by a force that even the mighty capitalist is powerless to dislodge, namely the language barrier. Nevertheless, to the capitalist, the modern nation-state still fulfils an essential and positive role. In the world of the ancient wanderer there was no territorial structure. Not, that is, until the settler started to commandeer and fence off land on which to cultivate his needs of life. The settler's landshare was the first allodial estate: an estate held in absolute ownership in which the owner owed no obligation, rent or tribute to any higher owner. But this did not last. Not satisfied with what the land returned for their own labour, men of violence demanded tribute from the settler. First, a local thug set up a protection racket and eventually he or one of his descendants became the local lord. Then a domineering lord became king over his peers and demanded tribute from them. These estates formed a feudal hierarchy in which the settler's landshare was the feudal estate under the local lord. The lord's local estate was a feudal estate under the nation-state of the king. Eventually, the internal feudal structure of the local estates broke down. Each local lord dispossessed his subjects of their landshares and enclosed all common land within his jurisdiction. Thus, the former landshare owners became his bound lab­ourers. Next, the division of skills and advancing technology won labourers freedom to move to wherever their particular skills were needed within the whole nation-state. But this absolved the local lord of all obligation to feed, clothe and shelter them as he had to do when they were his bound labourers or slaves. Yet he - along with all his peers - retained full possession of the land - the only means by which this vast majority could turn their labour into their needs of life. Advancing technology allowed the lord to farm his land and conduct his industry with less and less labour. Improving transport and communications allowed him to sell his produce to foreign lords who could afford to buy them. He no longer dep­ended on his freed former slaves to have the means to buy and consume his goods. It did not matter to him whether they worked or not - or whether they lived or died. So the land no longer supported or provided for most of its indigenous population. It only supported that fraction whose labour the lords had current need of. Thus the majority of the nation-state's inhabitants were either employed by a lord (so long as he had a perceived need for them), or unemployed with no means of turning their labour into their needs of life. A population thus dispossessed is there­fore insecure and hence dangerous. For whatever the laws of the land may impose, there are higher natural laws, which demand unconditionally that parents feed their starving children by any means. If, therefore, they cannot get their needs of life by applying their labour to what the Earth provides, people will take their needs of life by force. By poaching, stealing, pillaging. Therefore, it is in the interests of those who own the economic resources to provide the indigenous population with enough of the needs of life to alleviate their need to poach, steal or pillage. And it is for this selfish reason, not a human­itarian one, that the modern capitalist nation-state maintains a social security sys­tem. It is a vessel of containment in which to preserve indigenous human resources, while not in use, as cheaply as possible without invoking insurrection. The other need, which the landed lord ceased providing when his slaves won their freedom, was education. On his estate, his labourers received their necessary edu­cation and training as a natural consequence of their daily work. Today the capital­ist, through his limited liability joint-stock company, expects to be able to hire and fire at will, as many labourers as he needs of whatever skills he requires. But he does not expect to have to educate them. He expects them to be educated already. And it is for this selfish reason - not a philanthropic one - that the modern capitalist nation-state maintains an education system. It is the capitalist's means of turning an indigenous population into an economically useful human resource. To guarantee an on-going supply of the right kind of cogs for his corporate machine. This is evinced by the observation that, as the present State leans more and more towards abso­lute capitalism, it grows increasingly reluctant to fund higher education. There is no systematic reason why both social security and education cannot be im­plemented on a unified world-wide format. A wide range of engineering and comm­ercial standards are already global. However, there is a barrier which, no matter how hard capitalism may try, cannot be broken down by the endeavours of man. It is the language barrier. From the capitalist's point of view, the cultural diversity and international misunderstandings, that the language barrier maintains among the world's nations, create unwelcome geographic inconsistencies in his market and in his global labour pool. It is with reluctance therefore, that the capitalist resigns himself to have to work within the socio-economic structure of the nation state. He cannot overcome the language barrier, or its effects. The best he can do is en­deavour to influence the shaping of the social and economic policies of the nation state so that they become as conducive as possible to the maximising of profit and to the accumulating of capital. He must control those who govern the nation states in which his enterprises operate, and thereby control those who are governed. As an individual, the capitalist lives in a global world. He lives in a free world. What­ever his home state, his vast resources allow him to travel freely wherever he wishes - across political divides, across international frontiers or even the front-lines of war. He trades freely as an equal in a global market. He can buy or sell what he likes where he likes when he likes. He is a peer within a global society. A true in­heritor of the Earth. But what of the labourer? He owns none of the planet on which he was born. He possesses and controls none of the means it provides for turning his labour into his needs of life. His rightful share of it was wrested from him long ago through war, seizure, enclosure, disinheritance and misfortune. It is this class of individual - he who forms the majority of humanity - with whom I am concerned. How does this capitalist world treat him? He is a subject of the state in which he lives. He is constrained to live under a sys­tem of law he had no part in making. 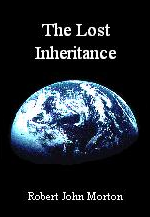 He is forced to fight to defend the possessions of an elite in a land in which he has no inheritance. He exists for no other purpose than to serve as an available economic resource for those who own the land in which he lives, to be used as, when and if they choose. He is a captured consumer in a seller's world. He is the source of revenue that sustains the means of his en­slavement. Yet in every encounter with the omnipotent cretins of bureaucracy (gov­ernment or corporate) he is assumed a liar, a cheat and a malingerer - unless or until he can prove otherwise. The human life-form alone is an incomplete system. It cannot function without the food, clothing, and shelter that its planetary environment provides. But the planet­ary resources that convert the labour of man into his needs of life are, under the regime of capitalism, owned (or controlled) by what, out of the entire population of the planet, amounts to no more than a small elite minority. This minority is not made up of the elected custodians of our planetary heritage. The universal well-being of mankind has never been part of their agenda. On the contrary, they are self-seeking individualists whose shamelessly declared aim in life is unlimited private acquisition. Their insatiable greed has ignited a global process that continually increases the disparity of human wealth and well-being - a process that is guarded and sustained by the inequitable laws of the capitalist state. Capitalists, plus those who represent their interests at State, plus those of the lab­ouring poor who, in the blindness of their delusion, vote them into power, are obvi­ously convinced that the principles and effects of capitalism are right, proper and morally just. That this elite few should inherit the Earth, while the rest of mankind waits in the wings of poverty until one of that elite minority wishes to exploit them for his own selfish ends, is seen as simply part of the natural order of things. It is simply the way the world works - the way the universe operates. In the 1950's, prophets of science promised a glowing future in which the support of a comfortable and stimulating life would require an ever-decreasing amount of our time and effort. Science has kept its promise: but society has not. The regime, under which we exist today, still clings to the antiquated principle that an individual should be rewarded only in proportion to the work he performs. If he does not work, then he shall not eat. This principle is adhered to irrespectively of whether or not there is any work for him to do. And it is enforced whether or not those Elite, who own the only means of turning his work into wealth, allow him to do so. The result is all around us: the insidious and inexcusable circumstances of famine in the midst of plenty. As a conscious life-form, as a sentient being whose whole func­tion and life-process is inextricably bound into the terrestrial environment in which it was born, I do not think it is right that most of mankind should be forced to live the way they do. Losing the little I once had made me think. Now I want more. I want my share of Planet Earth. I want to own my fair and rightful share of the means it provides to turn my labour into my needs of life, and the perfect liberty to exchange with others the fruits of our labours as together we see fit.